Microwave ovens are handy I know. They are small, cheap and very versatile. You can cook a meal in seconds. You can take food out of the deep freeze and in minutes its ready to eat. But what about microwave oven dangers? That’s something we hear less about. That’s what I want to explore in this article. Microwave ovens use electromagnetic fields to heat food. Over time the door seals leak. I have even found cases where new microwave ovens leak. In a microwave oven, microwaves at 2.45 GHz (otherwise known as radio frequency (RF) radiation) are produced by a device called a magnetron. These microwaves bombard the food causing the molecules to rotate at the same frequency millions of times a second. This agitation creates molecular friction, which heats up the food. When you switch your microwave oven on this RF radiation permeates into your home traveling through walls and ceilings. Added to which the oven cables and motor give off high magnetic fields (often over 10 mG), extending over a meter. And that’s not all. There’s another side to the coin. – A study published in The Journal of the Science of Food and Agriculture found that broccoli cooked in the microwave with a little water lost up to 97 percent of its beneficial antioxidants. These antioxidants are the body’s best fighting mechanism against cancer and a host of other debilitating diseases. – An Australian study found that cooking with microwaves caused a higher degree of “protein unfolding” than conventional heating. Russian and Japanese studies have already come up with startling revelations how foods drastically lose nearly 60-90% of their food value when cooked or heated in microwave ovens. In fact, it’s now proven that significant portions of Vitamins B, C and E, minerals and other essential ingredients are lost by foods when they are exposed to radiation in microwave ovens. Cooking food with a microwave oven is a double-edged sword. On one side, due to microwave exposure, foods lose antioxidants that reduce their ability to strengthen the body to fight cancer. On the other side, due to the agitation during microwaving, numerous free radicals are set free, which attack the cells of the body and damage their configuration. In medical parlance, one of the key causes of cancer is abnormal growth of cells due to loss of their original configuration. Now isn’t that a double-edged sword? At least then, some of the free radicals will again resettle in the matter, and less harm will be caused to the tender cells of the mouth, the throat, the esophagus and the stomach. Another issue with microwave ovens is the use of plastic wrap. One scientist * has recently claimed that this common plastic wrap that is frequently used in microwave cooking produces an identified carcinogen (cancer producing agent), known as DEHA (diethylhexyl), which easily gets transferred to food. These agents mimic endocrine hormonal system in the body, blocking the hormone’s normal secretion and activity. When this happens, there is significant risk of developing problems with fertility and also cancer. Actually, most of us are not even aware of these complications. Some users recommend allowing the food to settle for at least 3-4 minutes after it is taken out of the microwave oven, and then eat it. To learn more about the dangers of using a microwave oven and microwave technology , see this interview with researcher Walter Graham. 1. If you don’t currently own a microwave oven don’t buy one! Buy a steamer instead. It’s a much more healthy way to cook food. 2. If you do own a microwave don’t use it. 3. If you are not ready to go this far, if you have children, pregnant women and persons with low immunity in your home, don’t allow them to come to the cooking area (or the walls behind it) when your microwave oven is on. 4. Keep at least one meter away from the oven when it is working. Your risk of EMF exposure will be reduced significantly. If you want to see for yourself the magnetic fields and radio frequency radiation being emitted by your microwave oven you can do this easily and inexpensively with an EMF meter. This post was last updated August 2017. As a heavy user of microwave ovens for more than a decade I assumed they were safe. People should not assume this and read the research. 2) Microwaved food is less nutritious and even contains toxins in certain cases. Each of these reasons are sufficient in itself to stop using your microwave oven. We use a toaster oven quite often now for reheating things. Well, someone at work posted a big sign on the microwave oven telling people to clean up their mess when they splatter the inside. I printed this article and put it on the counter next to the microwave yesterday (10/30/12). I found the article in the recycling bin today (10/31/12). if you live in an apartment complex this must be very dangerous if the person above you, next to you and below you use microwaves and wifi right? these will go through the walls correct? The EMFs dissipate as soon as the microwave oven is switched off. But the effects on the human body are long term. Its difficult to say how far these microwaves travel. 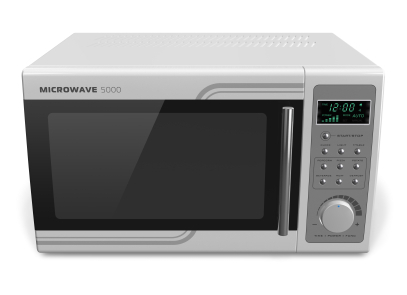 The power levels are relatively high on a microwave oven, usually around 1000 watts. A cell phone, for instance operates under 2 watts. You can expect exposure to be significant even in the next room when its on cook mode. According to the Cornet ED85 rf meter that I bought, the microwaves DO go through walls, big time. The microwave at work, when I tested it, racked up scores in the hundreds. It was out of control. It was still out of control on the other side of the wall and all the way down the hall. Every time someone uses it, I am getting fried. So is the boss, whose office is nearby. I think it’s a very old oven. I tested the one at home and it only went up to five or so. there has got to be some sort of protective film that we can apply to the face of microwave oven when we DO need to use it right? It cant be that difficult to invent. I’ll buy one! I try to minimize my use of microwave as much as possible. If I must use it to heat something up, is it better to heat on low power for a longer period of time, or on high but a shorter period? Lloyd, I cannot seem to get a direct answer about a question I’ve had … I hope you can provide insight. Due to health challenges in the reproductive area, I use a heating pad. I switched from an electric plug-in type a year ago. I started using a homemade one suggested to me – I put dry rice in a pillowcase and heat it up… in the microwave. I run cold and have pain so I heat this pack up at least 5-6 times a day, for 4 minutes, and place it on my pelvic area. In addition to the microwave dangers, is the rice pack radiated? Am I literally placing radiation on my body in the very area that is my pain point? Or, is this rice pack a safe option?